It's been awhile since I've posted! That's because I broke my wrist February 8th. It was my right wrist and of course I'm right handed! I was off work for 4 weeks, which in hindsight wasn't enough time. I should have been off at least another two weeks. I started taking the cast off last week and now am just wearing something around my wrist to keep it stable. I still wear the cast overnight. I still have some pain and I don't have full mobility yet. I still struggle with some every day things. I'm dying to start crafting again! Friday night I thought I would try to cut some chipboard to see if it bothered my wrist. Low and behold it didn't so I made this book! The moral of my story is....if you dog shits and it's icy out.....don't pick it up! 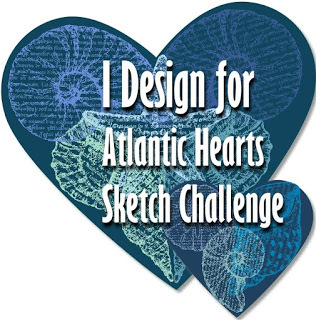 This isn't my own design. I just want to get that out there right from the start. 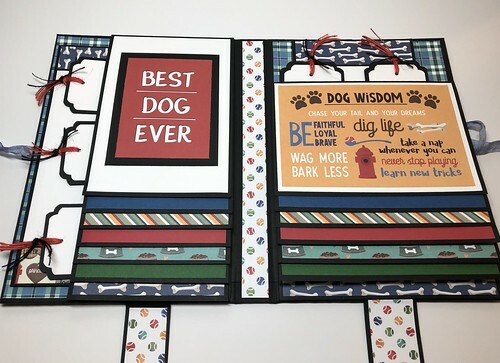 This Folio design is by Frances Long from Your Book Of Memories. She is awesome! 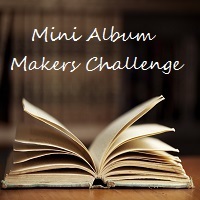 If you've ever wanted to make a book from scratch and haven't I encourage you to check out her site and see if she has something that you would love to create. I've made tons of books, some my own design and some I've followed tutorials. I've followed Frances for a long time and just recently bought some of her tutorials. She is an excellent teacher. If you've never made a book before she will guide you through the process. You can also find her on YouTube and watch her walk-through's of her books. She links you to her site if you're interested in the tutorial. 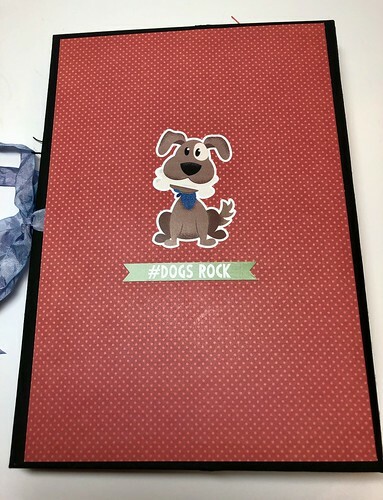 For this book I used the paper collection Fetch by Photo Play. On the cover I used one of the cut-apart's from the collection. For my ribbon closure I used seam binding. I took faded jeans distress ink and dyed it. On the back cover I used two stickers from the sticker sheet. This Folio measures 6 - 9/16th inches wide by 9 - 1/2 inches tall. The double waterfall will hold 26 photos. 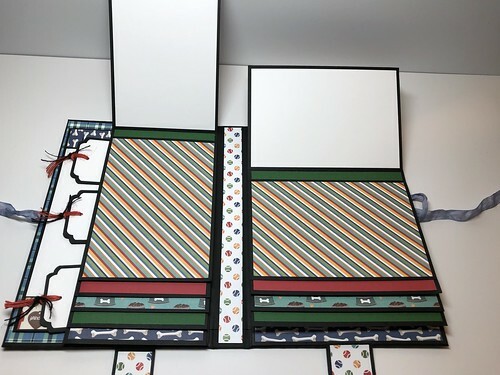 All photo mats are made for 4 x 6 photos. 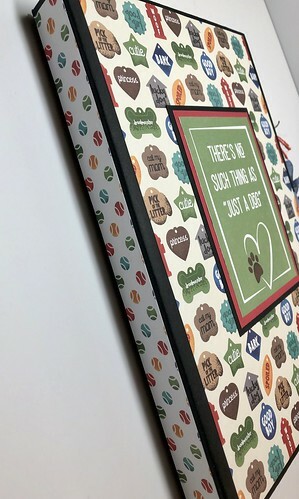 I cut out the two dog photos above from one of the cardstock sheets and mounted them on black cardstock. On the first two photo mats on the waterfall I used cut-parts so those spots wouldn't be used for photos. 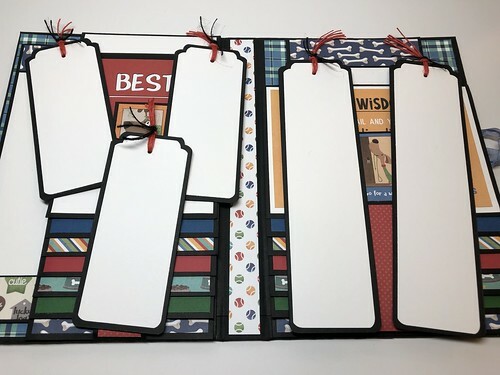 There are five tags that can be used for journaling. Both sides are white. 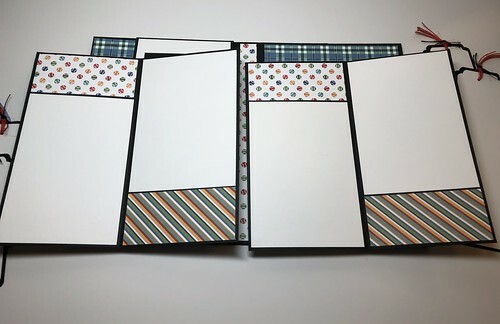 I added two booklets that will each hold an additional four 4 x 6 photos. That brings the total of photos that this folio holds to 34! After I took this photo I noticed that I have the bones on the photo on the left going in a different direction. I thought about fixing it, but the bones can go in either direction! 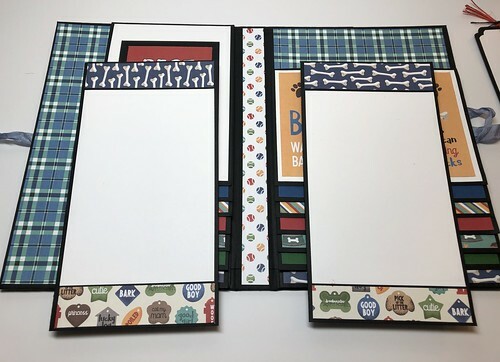 I love making Folios! They are my favorite. I will be making more of these in all kinds of themes! 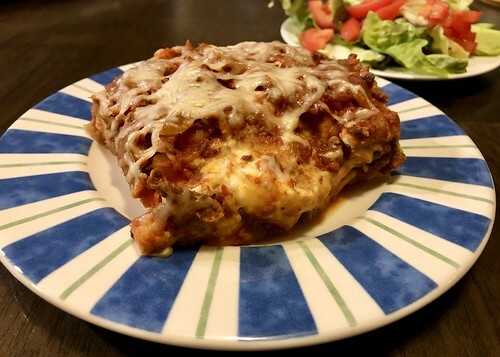 This lasagna recipe is from the book below. 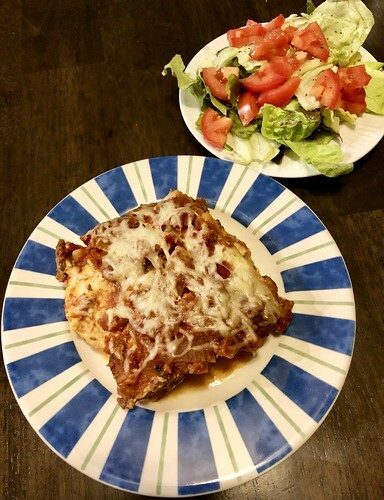 I've been craving lasagna but didn't want to make the recipe I normally use. 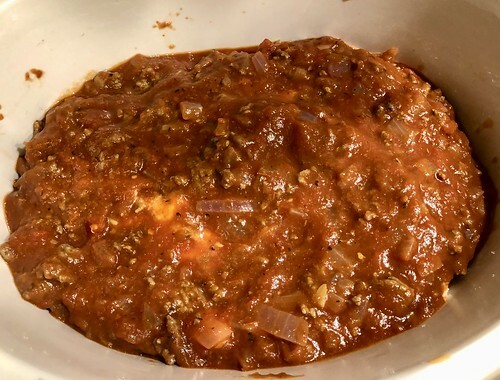 This recipe is six large servings and is made in the crock pot. 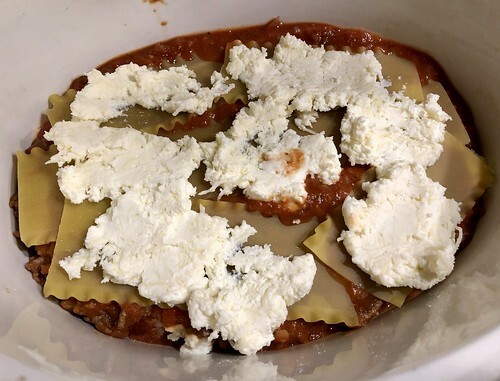 The photo above is the second layer of noodles and below is the second layer of the ricotta/mozzarella layer. Final layer of beef mixture. 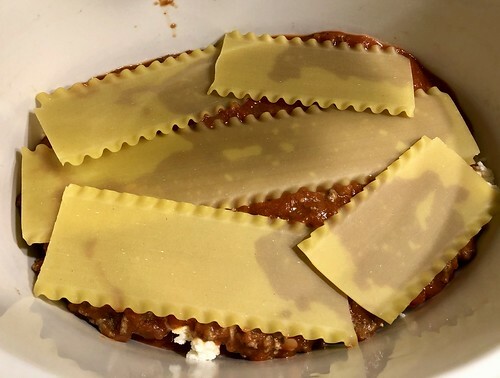 I slow cooked this for four hours on low. 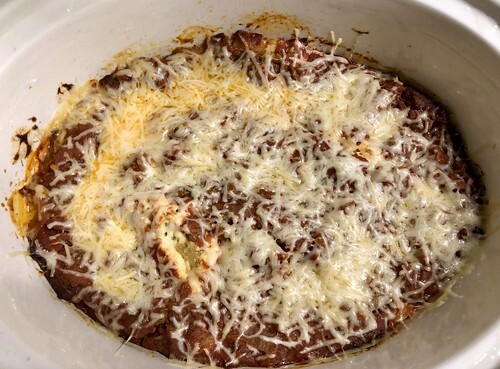 The photo above is the final layer of mozzarella/Parmesan cheese. 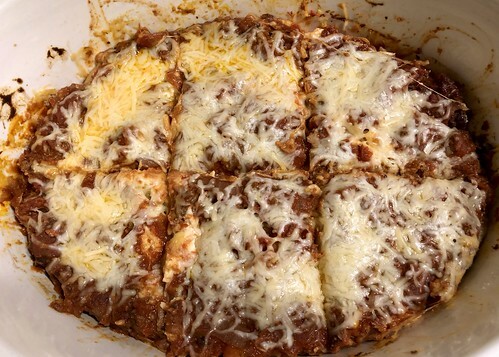 The crock pot was then turned off and I waited around 10 minutes to let the cheese melt. After it had "firmed up" a little I divided it into 6 servings. They are quite large. 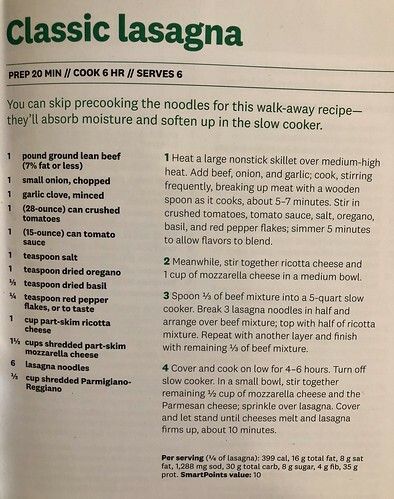 This recipe comes in at 10 SmartPoints for 1/6th of the recipe. I'd make it again, I thought it was pretty good. 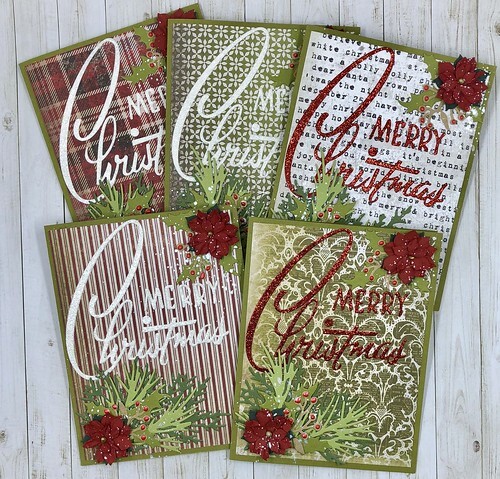 Christmas cards are one of the occasions that I love to create cards for. I've downsized my card list considerably. I used to attempt to make every card I sent out different. This year I decided to do something different for me. I created a small amount of one card design and then moved on to another design. 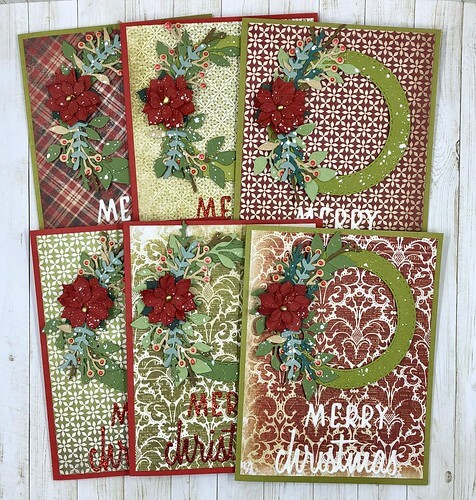 I created these wreaths but changed up the background paper for each card. I didn't purchase any new Christmas cardstock this year. I just used what I had on hand. 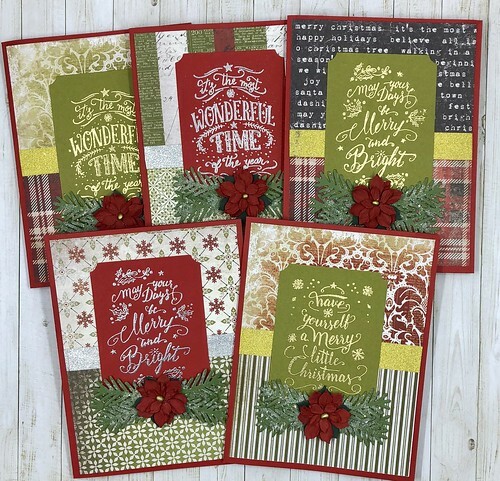 All of the cards shown below with the exception of the snowflake cards use Tim Holtz Idea-ology Paper Stash Tidings cardstock. I've had it for awhile and I love it. It's pretty much used up. 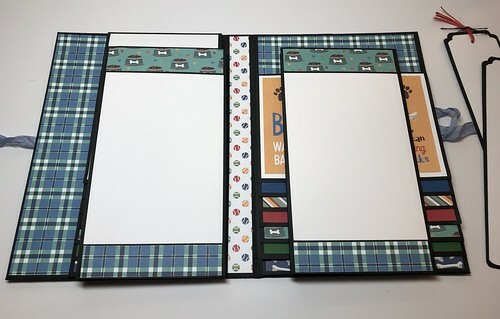 I'll have to see if I can find another pad of it or see what other Christmas cardstock Tim Holtz has available. I love his products because they are so vintage. For my wreaths I die cut circles using the Double Stitched Circles from Our Daily Bread. All of the greenery was die cut using Sizzix Thinlits products. 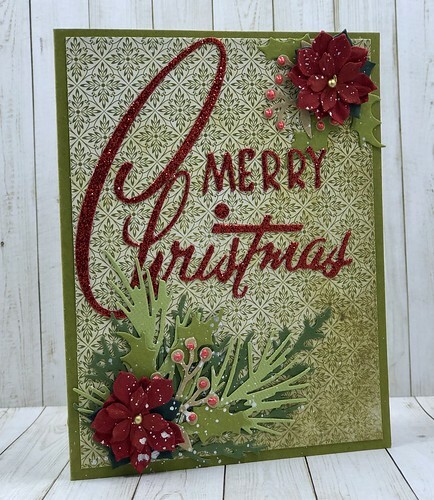 I used Tim Holtz Alterations Retro Merry Christmas, Holiday Words: Script - Christmas and Garden Greens. I used some miscellaneous poinsettia's that I picked up last year at Hobby Lobby. I did make my own poinsettia's using a Sizzix die. After I had them all together and I had sprinkled some Papericious Frosting Powder on them, I didn't like them. I just set them aside for another project. I used glitter cardstock for the sentiments. After the wreaths had been assembled I splattered them with Perfect Pearls. This card was my favorite! For the next card I used the same paper. 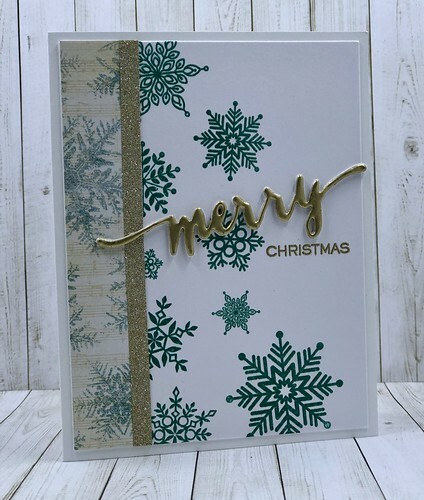 I heat embossed the sentiments using Hero Arts Gold and Silver embossing powder. 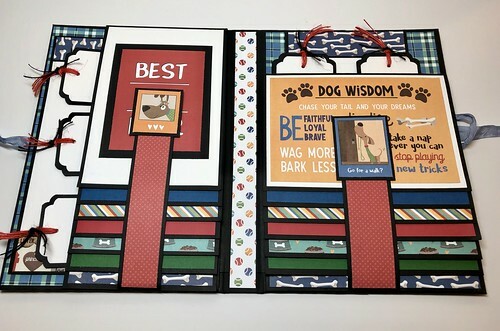 All of the sentiments are from the Stampers Anonymous Tim Holtz Mini Doodle Greetings stamp set. I bought this set and the larger set last year and this is the first time I've used them! I added a strip of Tim Holtz Idea-ology gold deco tape to each card. For the greenery on my cards I used Concord and 9th's Take A Bough Die. 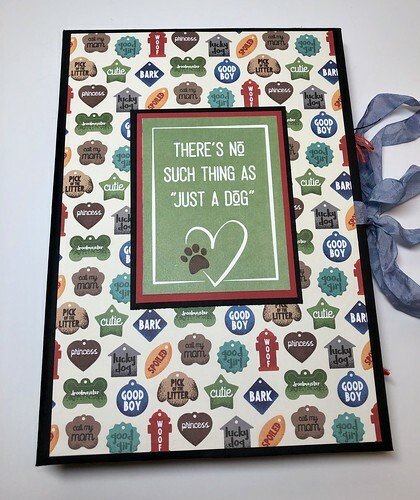 I used Rangers Tim Holtz Distress collage medium that I spread on with a brush and then sprinkled on frosting powder from Papericious. I first saw this stuff at a stamp show I went to this past summer at the Heartfelt Creations booth. The poinsettia is from Hobby Lobby. This card again uses the same paper as the two cards shown above. 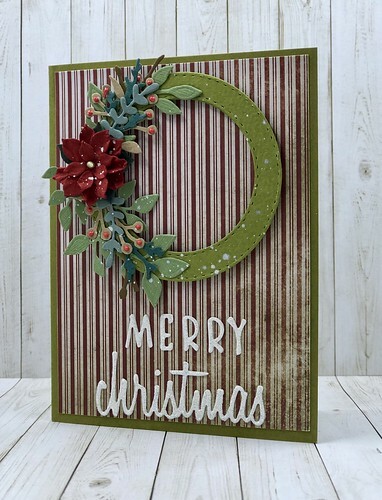 For the sentiment I diecut Merry Christmas using the Sizzix Tim Holtz Alterations Retro Christmas die. The greenery is Holiday Greens and Garden Greenery. 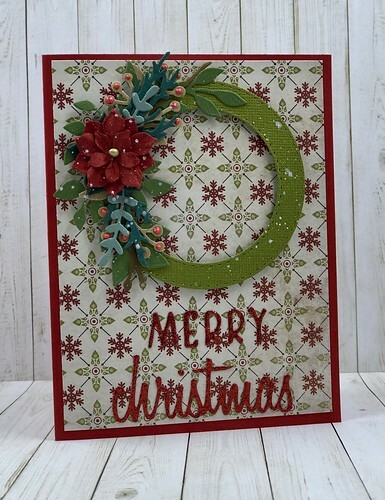 The same dies I used above on the wreath card. For both cards I added Ranger Ruby Red Liquid Pearls to the Kraft colored cardstock. I again spritzed perfect pearls over the greenery. 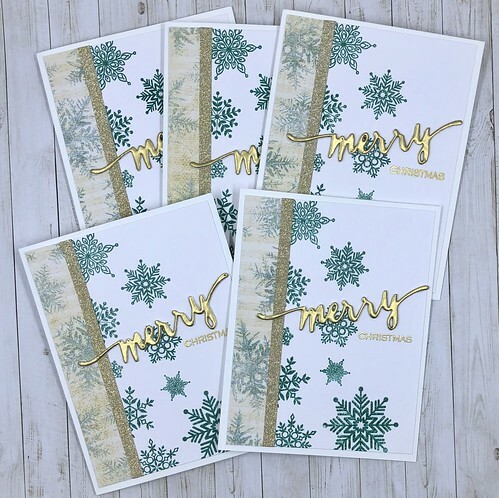 For my snowflake cards I heat embossed snowflakes using the Simon Says Stamp Lots of Snowflakes stamp set. I stamped them with Distress Oxide ink in evergreen bough and then used Hero Arts clear embossing powder. I cut a strip of patterned cardstock from a paper pad by The Paper Studio called Old World Winter. I added a strip of Tim Holtz Idea-ology gold deco tape. 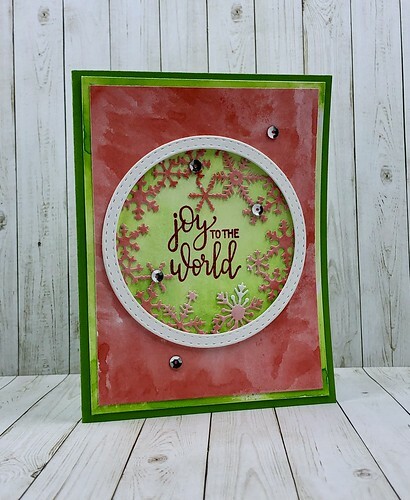 The stamp and die are from WPlus9 called Hand Lettered Holiday. I cut three Merry die cuts. 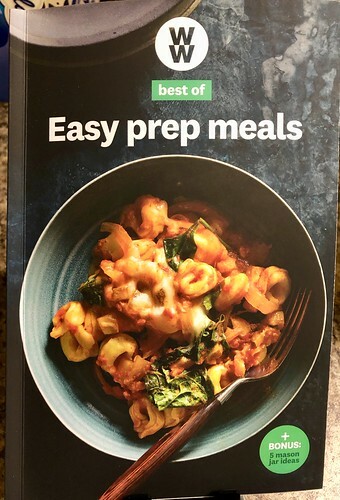 Using one I added VersaMark several times and kept heat embossing it with Hero Arts gold embossing powder until I was satisfied with how it looked. I then adhered three die cuts together. I then stamped the Christmas sentiment and heat embossed it with gold embossing powder. I happened to be up in Plymouth last Saturday so I popped into Anchor Paper. I found this die from Hero Arts called Snowflakes & Ornaments Fancy Die. There's another piece to the die so that you can make the snowflake look like an ornament. I chose not to use that piece for this card. I watercolored two pieces of cardstock. One with Distress ink in candied apple and one in mowed lawn for each card. I die cut the circle snowflake out of the candied apple cardstock and then adhered it to the mowed lawn cardstock. I then die cut three circles for each card using white cardstock and the double stitched circles die from Our Daily Bread. After adhering them together I added them to the front of the card piece around the snowflakes. I added a few silver sequins to the front of each card and they were done! I still have a few cards that I'm working on but this is the majority of the cards I made this year. I'll post any others I send out in another post. Design by The Momma Bird. Simple theme. Powered by Blogger.